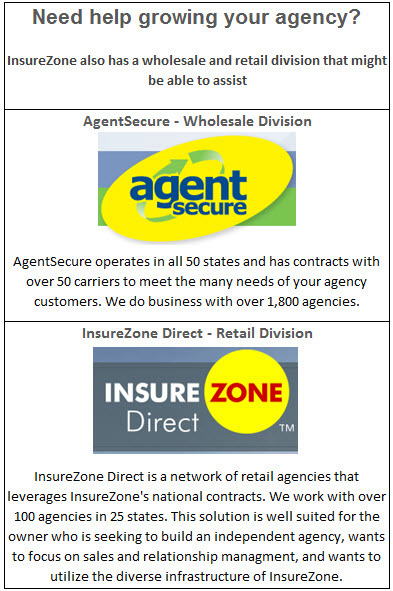 InsureZone, part of the nation's 115th largest independent insurance agency, offers a full line of personal lines and commercial insurance products for small business from top-rated carriers. InsureZone represents commercial carriers such as Travelers, Chartis Specialty Workers' Comp, Progressive, CNA, The Hartford, Liberty Agency Underwriters, Zurich North America Small Business, Cornerstone Underwriting Partners and the Philadelphia Insurance Companies. Personal lines are offered from Travelers, MetLife, Safeco, Progressive, Chubb and The Republic Group. InsureZone commercial product offerings include: BOP, Workers' Compensation, General Liability, Commercial Auto, Umbrella Liability, as well as specialty coverages such as Professional Liability, Employment Practices Liability, Directors & Officers Liability and various bonds. InsureZone personal product offerings include: Personal Auto, Homeowners, Dwelling Fire, Renters, Condominium and Personal Umbrella. For more information, call 1-866-467-9663 or visit the InsureZone Web site at www.InsureZone.com.